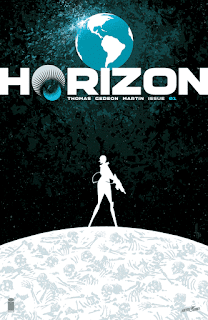 The Fellowship was fortunate enough to obtain a copy of HORIZON #1 from Image Comics. Brandon Thomas writes, Juan Gedeon draws, Frank Martin colors, and Rus Wooton letters. Zhia has come a long way. She has landed on her destination planet far from her home. She has sacrificed much to help protect that home. And her implants have been damaged by her landing here, on this world where she is surrounded by its hostile, unpredictable inhabitants. Her mission is to stop these creatures from leaving this world called Earth, so that they won’t invade her own. Humans invading an alien world. The idea might have seemed crazy a few decades ago, but we’re at a point now where it really doesn’t. There’s a lot of potential in the concept behind this story, and it’s potential that we really need to start exploring. (It could also turn political, but I’ll stay optimistic for now.). Zhia is a great character already, and the art shows us a near future that looks as cool as these new aliens do. There are ideas nested in this story that are going to prove very important in the next few decades. And that’s the great thing about science fiction – we may not realize how relevant it is to us until much later. Keep an eye on this series, seriously. HORIZON #1 is available now at your FLCS or at imagecomics.com.